Bathroom with a Spa-Like Atmosphere! This bathroom offers elegant and spa-like design! 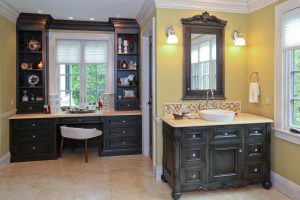 With ample room, warm colors, traditional accents, and classic details in the custom cabinetry, the luxurious spa experience is achieved in the comfort of the home. A Truly Unique Kitchen Design for a Food Aficionado! James Kershaw Associates, LLC. Copyright © 2019. All Rights Reserved.